Meditative concert during lunch at the restaurant Lindhaga at the hospital of Ängelholm with music from ”meditations” album and new material specially composed to the hospital. The concert is part of the work as artist-in-residence at the hospital, being part of the rehab clinic. 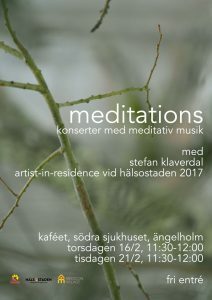 Meditative concert at the hospital of Ängelholm with music from ”meditations” album and new material specially composed to the hospital. eyes like a flame of fire is performed at the legendary Der Musikverein in Vienna (arranged by Gesellschaft der Musikfreunde in Wien) in a concert with Helge Stiegler on recorder and electronics together with narrator Nicole Beutler. At the city library, amidst normal visitors reading books and studying, musicians are playing intense music, but nothing is heard! However, if you wear headphones available at the site or go to a temporary web adress the mystery is revealed. 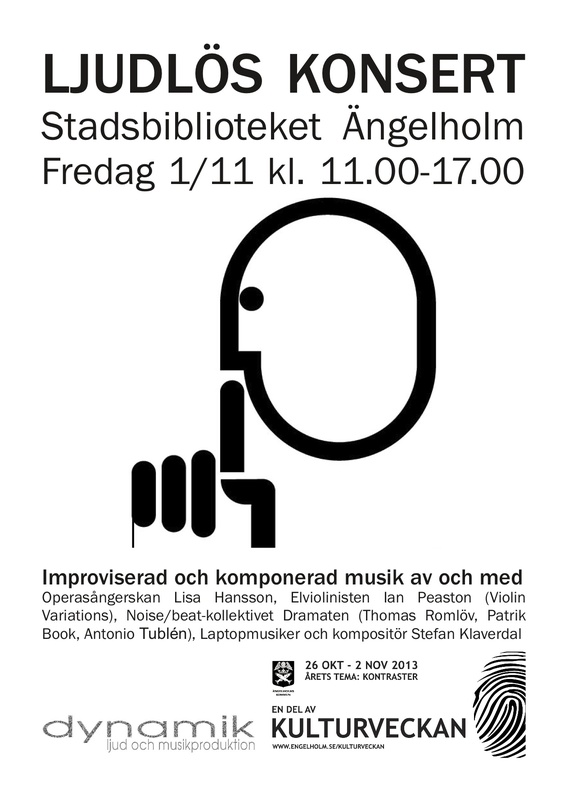 You may even become part of the silent concert even if you are not aware, with microphones and sensors put out in the library. 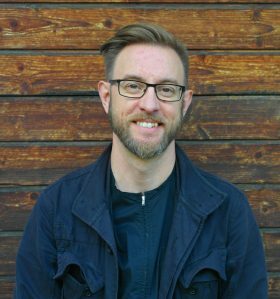 In collaboration with artists elucian (electric violinist Ian Peaston), Lisa Hansson (opera singer) and the noise band dramaten. STREAM can be found here! During Göteborg Pianofestival Resonate – a reconstruction of fragments from Beethoven Sonate op. 27. is performed by Julia Sigova and Joar Sörensson. The piece is composed to be performed by one student and one professional pianist. This is not a concert. It is not a sermon or a play. Perhaps it is a kind of being, or a possibility to receive music and visual scenography in a moment of stillness, reflection and inspiration.The event consists of new music for voice, bass clarinet, organ and computer in combination of visual scenography with video, lights, shadow play and much more.